Active users:The most important metric to know for your app is the active users of your application. The trust is downloading an application is the easiest part but getting the user retained to your app is much tougher. It is for this reason that we must consider both monthly active users i.e. MAU and daily users i.e. DAU. Knowing everything about them, the use they make of the application, where they are from, etc. allows you to segment them and define personalized actions to each one in order to build loyalty. The constant new strategy depends on the detailing of the application usage by the users. Knowing the flow of navigation within the application is very important because it allows us to know what screens our users have gone to and, above all, on which screens they have remained, also which part they spend more time and which not. Detailing on the same gives an idea of the next actions i.e. further improvements. Start of the sessions:How many minutes do they use the application? Those who enter and leave, surely have found an app that is not what they were looking for. If this is the majority, we are in front of an incorrect communication. Just the way, we measure the bounce rate for websites to see how are users reacting towards the website when the visit, we need to check the same for apps. Retention:Do you know the fact that 20% of mobile applications are only used once and the rate is increasing day by day. We need to analyze this metric always so that the app does not start to come under the 20% ratio. We can measure retention as the percentage of users who return to the app after their first visit. And not only is it important to know the retention of the users but also the frequency with which they return to the app. As more committed and loyal the users, better monetization strategies app can develop. Knowing how much it costs to acquire a user is important because based on this information we will know how much we can invest in advertising. The CAC is calculated by adding up all the expenses used to obtain the new client (marketing, commercial, infrastructure) and is divided by the number of clients obtained in this same period. Average Revenue Per User (ARPU):Nothing is free, nor your efforts. It is obviously important to know the revenue that you make out of a single user. There may be a fluctuation but average revenue per user is the best way to analyze your performance and the growth of the app. This is calculated by adding all the revenue per user and dividing the same by the number of users. The revenue may include in-app purchase, advertisements, partner deal, etc. Lifetime value (LTV):This is most common miss that happens as everyone looks to have instant revenue, ignoring the fact that the user which is now giving a very little revenue can become the most important one when looked from its lifetime value. LTV is calculated by multiplying ARPU with the span of a user with the app or average expected life of the user. 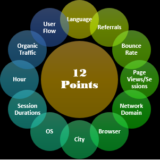 The above the seven important metrics that should always be looked on but yes these are not the only as every app has its own KPI and metric to be measured but the above seven should not be missed for any.